Mix elegance and sophistication with this ladies' watch from Citizen. 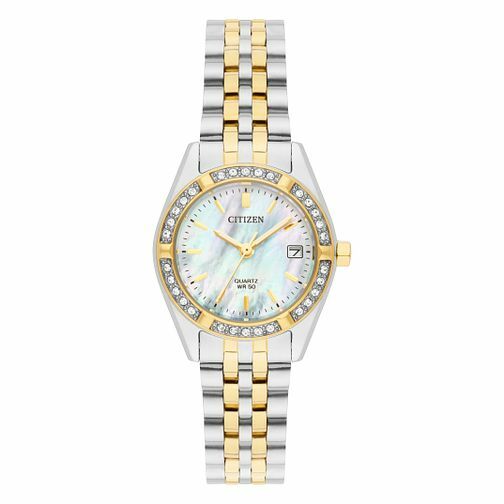 This stunning two tone quartz watch is given a chic edge with a pretty mother of pearl dial complete with date box and a sparkling bezel set with Swarovski crystals. Citizen Ladies' Two Tone Stainless Steel Bracelet Watch is rated 4.0 out of 5 by 1. Rated 4 out of 5 by Anonymous from Beautiful watch. Very much valued Christmas gift. I purchased the watch online and used the click and collect store facility. The watch was exactly as seen on the website. Packaged in a presentable case to gift someone. All features of the watch were exactly as detailed. A Christmas gift for Grandma who has not since taken it off.